It was one of those nights of cooking when things just didn’t go quite as planned, and the end results (though ultimately successful) were anticipated in fear and doubt. The menu included a spring salad mix, garlic parmesan bread, meat-and-roasted-vegetable lasagna, and a tart apple pie for dessert. Jenny baked the apple pie, which will be featured in a following post. 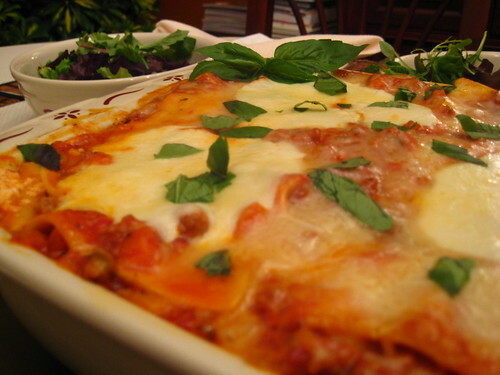 This post is all about the lasagna. My very first made-by-me lasagna. I’m not one to get excited about lasagna. It's always too meaty, or cheesy, or meaty and cheesy, and just plain boring. I’m a vegetable-lover, and layers of simply meats and cheese and pasta just doesn’t cut it for me. Give me fresh, crisp, colorful veggies, and I’m all in. So the thought of making my own lasagna any way I want has been tickling me for some time. 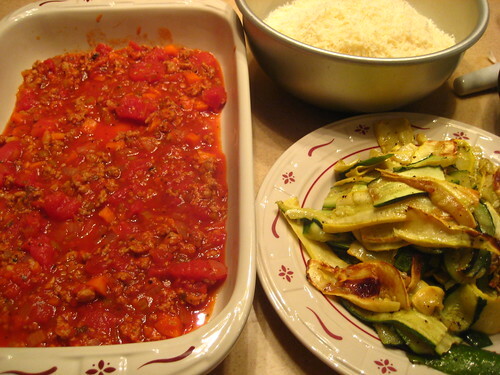 I was inspired by Kristin’s photos at The Kitchen Sink to include roasted zucchini and yellow squash in the dish, but I also wanted to go with a classic meat lasagna, so I added ground turkey to the sauce. I made my usual tomato sauce with garlic, onions, carrots, and celery, along with various spices. So far, everything was going according to plan. Lasagna is supposed to be easy. A lot of work, maybe. A lot of expensive cheese, definitely. My roasted veggies were a bit on the mushy side, but this I could deal with. 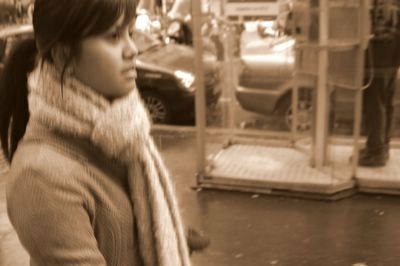 It was the layering that started getting me worried. Like I said, lasagna is supposed to be easy. The concept is simple: sauce, pasta, cheese, veggies, repeat. 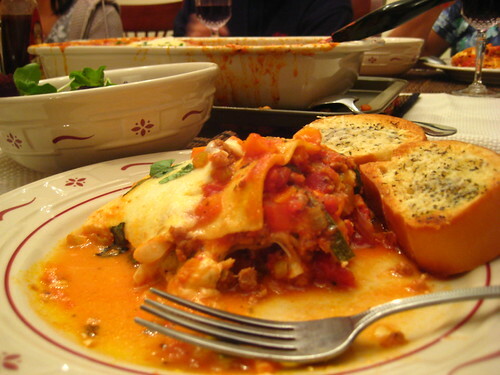 Except that once I got to layering, I realized that lasagna is, well, a lot of layers. Too many? 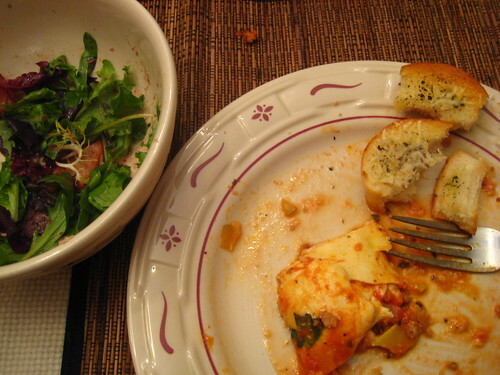 The last spread of mozzarella cheese on top was very close to the top of the casserole dish – too close for comfort. I was convinced I over-layered. That the lasagna would bubble over. And then I tried lifting the dish and realized that I had just created nearly ten pounds of lasagna. It was frickin’ heavy. These are the doubts that overcome a newbie cook when making a dish for the first time. I began second-guessing everything I did and feared that dinner would be ruined. I was afraid that I would fail a dish as simple as lasagna. And when I covered the lasagna with aluminum foil to prevent it from bubbling over in the oven and to keep the cheese from burning, I hadn’t thought of the steam getting caught and making the dish watery – resulting in a mini freak-out when I checked on the dish 45 minutes later. Watery, mushy lasagna. And too damn much of it. But I was told not to worry. It would taste fine. The sauce didn’t bubble over. The watery pool floating atop the cheeses could’ve easily resulted in all of the veggies stuffed in the folds, not just my silly mistake, and a few minutes in the open air seemed to take care of it. And it certainly wasn’t too much food for six hungry people. Life would go on. Dinner would go on. So as the lasagna cooled, I took pictures, as usual. OK, so it doesn’t look like perfect. It’s actually kind of a mess. Layers and sauce and juice and veggies spilling all over the plate. Not the solid squares of pasta cake that I was hoping for, but it was still a delicious mess. And Murdo made soft, cheesy garlic bread to help mop the plates clean. Um, yeah. My mouth is watering. Looks delicious!!! You know, I never thought lasagna was easy. My moment of panic always comes when I'm trying to get the long layers of cooked pasta from not breaking as I do the transfer and assembly. 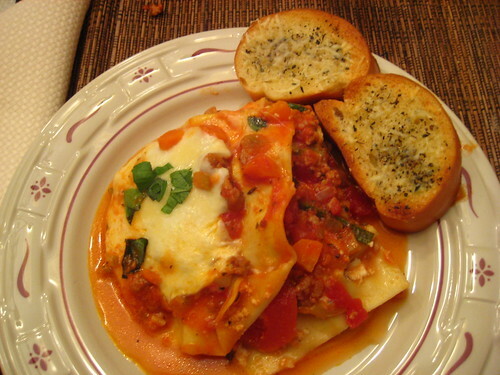 Your lasagna was uber yummy! btw, i used no-boil lasagna sheets. so that made it a lot easier...just one less thing to worry about as i assembled this beast of a lasagna. 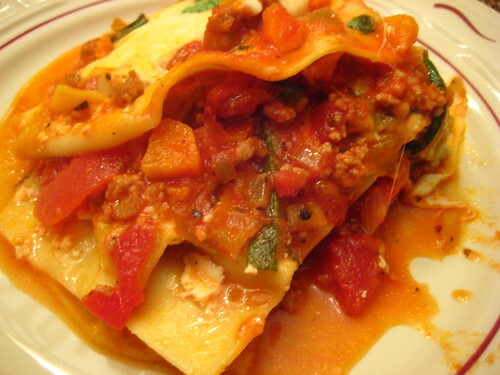 shanna - if you're thinking about lasagna this week, i suggest the no-boil pasta. gotta love those shortcuts!